Paleography is the study of old (Gr: παλαιός/paleo) writing (Gr: γράφειν/graphein). 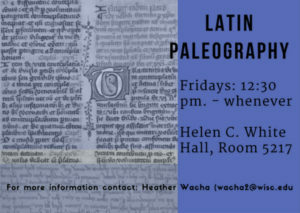 The recently-established Latin paleography group at the University of Wisconsin, Madison meets informally every Friday at 1:30 pm. 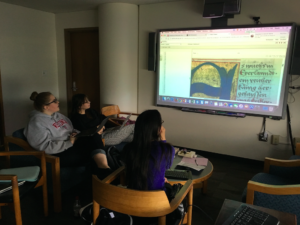 Anyone is welcome to bring food and gather in the SLIS conference room (Helen C. White Hall, room 5217) to decipher medieval handwriting and texts. Latin paleography is well-suited to collaborative and interdisciplinary learning. Participants from various fields bring documents from their own research, as well as particular paleographical challenges. The group is exposed to different hands and scripts, learns from each participant’s expertise, and brainstorms solutions to those pesky paleography conundrums. What brings us all together is the thirst for getting into the head of a scribe to better understand his/her writing and his/her ‘invisible’ worldview. 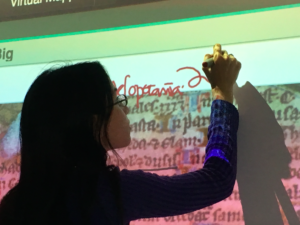 We’d like to thank the iSchool for letting us use the SLIS conference room, which offers a smart board – the perfect technology for brainstorming and demonstrating paleographical insights. We also thank Martin Foys, Professor of English at the University of Wisconsin, and DM, the software program he designed that allows scholars to annotate and link uploaded images. For us, this is a wonderful way to share our collaborative work. Stay tuned for updates on projects, research results, and publications that come out of the Latin paleographers’ efforts.